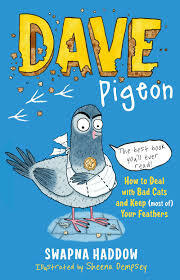 Dave Pigeon, by Swapna Haddow, is a hilarious, laugh out loud book aimed for children 6+. It’s typed by Skipper (a pigeon) and tells the tale of Skipper and his mate Dave, trying to outwit a mean cat. They want to get the cat out of the house so they can live in harmony with the Human Lady. The story is told from the viewpoint of a pigeon, and if a pigeon spoke human English, I think this is exactly how he would sound. Skipper addresses us, the readers, ‘if you can read this, you obviously understand pigeons,’ which draws you into the book straight away. Plus Dave interrupts the actual story by having conversations on what the chapter titles should be. This had me roaring out loud. Skipper and Dave are a great team, although I think Dave has an undeserved high opinion of himself. Skipper seems to be the real brains of the operation. The Human Lady is a fabulous example of a compassionate kind person. And you can’t help but wonder if mean cat is as mean as the pigeons suggest. The short chapters are stuffed with jokes, and the superb humorous illustrations by Sheena Dempsey add much to the story. I imagine new readers would find Dave Pigeon incredibly funny and accessible. I also think it would be a great book to read aloud either in a classroom or at bedtime… although your child might be laughing too much to ever fall asleep.